Wine racks are an essential part of a wine collection. They hold and display one’s bottles in many ways. As a wine collector, your main goal is to preserve wine until it has reached its full potential. This is why high quality wine racks must be chosen. In addition to quality, one must also consider beauty and functionality. These days, there are a lot of attractive wine racks on the market. They can be placed inside a California wine cellar or in any vacant spot in your home (in the living room, family room, kitchen, or on the wall). Designers have thought of space-saving ideas for wine collectors who have limited space in their homes as more and more are beginning to be initiated in the world of wine. Other’s priority is the material and decorative function of wine racks. Storage racks come in many shapes, sizes, materials, and designs. Wood is durable, easy to work with and obtain, flexible, easily matches any décor, and adds elegance to your space. Wooden wine racks can be stained according to your person taste. There are semi-custom wooden wine rack kits offered by Coastal Custom Wine Cellars California, allowing you to create a semi-custom wine cellar. Included in their kits is the wine rack with a table top, a favorite of many wine cellar owners. This allows a space for decanting and serving wine and for additional storage space too. Visit this link to view the Coastal Series line of semi custom wine rack kits: http://www.winecellarsbycoastal.com/custom-wine-racks-and-kit-wine-racks.aspx. Metal wine racks help you achieve a contemporary look in your wine storage space and stunning wine storage displays. They are commonly used in commercial wine cellars to attract customers’ attention. They allow easy viewing of wine labels and are adjustable, making them ideal to be placed even in small corners of your house. Racks made of wrought iron are very stylish and creates a classic ambiance in your wine storage space. Durability and versatility are the characteristics that make wrought iron one of the favorite materials in wine rack construction. There are traditional, decorative and vintage types of wine racks to choose from. Wine rack styles include free-standing, stackable, countertop, wine rack with stemware storage, and wall mounted wine racks. Wall-mounted wine racks (designed for direct installation to the walls) are ideal when space is sparse. Each style has its own advantages, so it’s best to have knowledge of them before purchasing one. You also have to determine the size of your collection or how many bottles you intended to store for a long time, the size of your wine bottles, the location where the rack will be placed, your budget, and of course, the look that you want in your wine storage space. For quality and reliability of your custom wine rack, contact Wine Cellars by Coastal at (888) 735-8889. 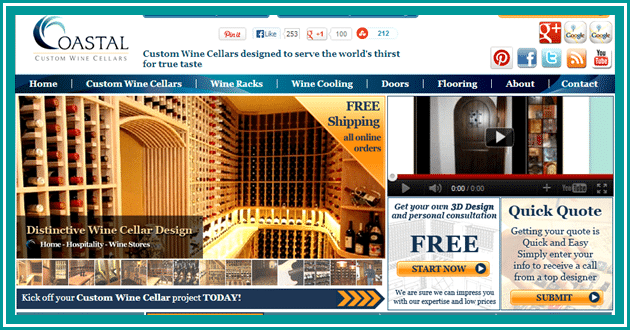 They also offer a FREE 3D wine cellar design.